There's a new obsession in New Zealand. 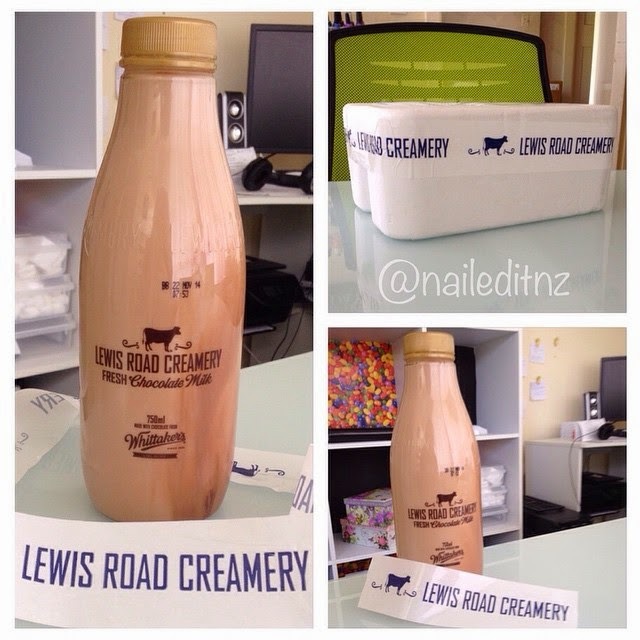 On the first of October 2014, Lewis Road Creamery released their new product - Fresh Chocolate Milk. It has become a huge deal! In fact, I'd say it's on par with Marmageddon, which happened a couple of years ago. Lewis Road Creamery's Fresh Chocolate Milk is, according to their website, "an indulgent chocolatey treat that combines Lewis Road’s Premium Whole Milk with Whittaker’s 5 Roll Refined Creamy Milk Chocolate, to deliver a delicious, velvety chocolate milk like no other." The problem is, it's near impossible to get a hold of. As Lewis Road is a relatively small Kiwi business they don't have the means to produce as much as New Zealanders are demanding, and when the milk is delivered it sells out within 15 minutes. Supermarkets are applying limits as to how many each person can buy, and I even saw a picture of a dairy re-selling is for $15 - cheeky! Naturally, the media have caught a wind of this and since then it seems the whole of the country is on a Chocolate Milk hunt. I've been keeping an eye out for it when getting my groceries for a few weeks, but recently I decided to give it a real try. I often walk with my husband to his work, which is just down the road from a supermarket. His starting time also normally ties in quite nicely with the supposed milk delivery time, so I had high hopes of grabbing one the first time I went in. On a Tuesday, I entered the supermarket and made a beeline for the chilled section. Once it was in sight, I slowed my pace and walked ever-so-casually past the cabinet, inwardly cringing at the fact I was only there because the media told me to be... I wasn't one of those people, was I? I glanced in, and quickly realised there wasn't a bottle in sight. Without stopping, I attempted to smoothly walk through the rest of the chilled section, and there was a clear moment of "Now What?" I was going to look like a complete idiot if I just strolled on out of there without anything. I ended up buying one red 50 cent K-bar. Totally cool. And such began my milk hunting routine. I learnt that the deliveries come between 9-10, and so when walking with Chris the next day, I tried again. Same story, no luck. This time my consolation prize was upped, to a Cookie Crumble ice block. On the third attempt, I thought I had it sussed. My flatmate, who works at that supermarket, confirmed that the milk delivery is at 10am on a Thursday, and that was the time Chris started work. Perfect. I walked into the supermarket, excited that I could finally see what all the fuss is about. I arrived to a line of people, which just grew longer and longer and longer. For chocolate milk! I wandered around the supermarket while I was waiting, grabbing some groceries but circling back to the chilled section. At first the staff said at first it should arrive soon, then told us that it was normally here by now. We crossed our fingers and waited a little longer. It was quite a relaxed, amused atmosphere, I should add; everyone felt a bit silly about the fact they were lining up for the stuff. Most people were talking to each other and making fun of themselves. I circled the supermarket one more time, and as I was coming back I saw a staff member coming from out back with a funny look in her eye - I had a feeling it was bad news! Sure enough, she anounced that there were no deliveries today. It was definitely a "first world problem" moment as there was a joint sigh of defeat and the crowd cleared. Most of the people who had been lining up for half an hour left completely empty handed. 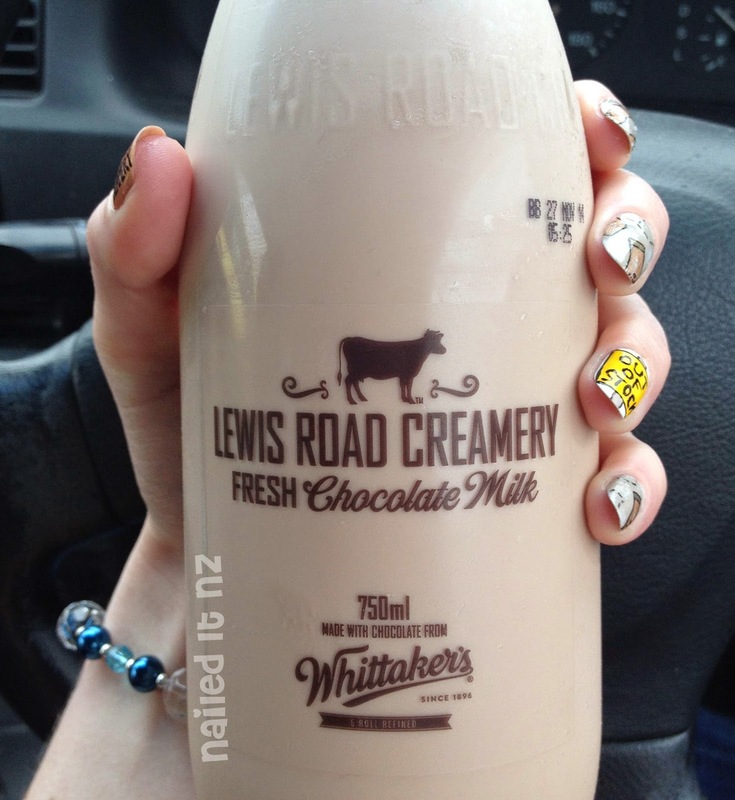 The next day I decided to paint my nails with a Lewis Road Creamery theme, to poke a bit of fun at the whole nation-wide obsession, now that I've had a taste of it (a metaphorical taste, of course). As you can see, the nails have the logo on the thumb. Three of the nails have mini bottles of the chocolate milk on them, and some dashed outlines - as they just keep disappearing! The ring finger was an "out of stock" sign, as that's what's most commonly associated with this milk. I wanted to pose my hand with a bottle of the milk, but as I had none I thought I'd add to the the theme of it not being available and printed out a picture of it, instead. Not quite the same as the real thing! Funny thing is, that an hour after I finished painting my nails, a friend (who had seen my post on Lewis Road Creamery's page) messaged me and said she had just got some from New World, and the shelves were stocked. My friend had just arrived to hang out, so we missioned it down to the supermarket and managed to grab a bottle each. Success at last! To be honest, I drunk it so fast that I didn't have time to savour it. My first impression was that it was delicious, but perhaps not ground-breaking enough to warrant the huge amount of attention it was getting. I think I expected a golden light to shoot from the heavens, or to fall into a chocolate-filled haze that would take days to awaken from. In reality, I reflected that it certainly was very nice, and had the strong, distinct taste of Whittaker's chocolate, but I also realised that it is probably not worth waiting in line for ages for - and it's sugar content means that it's definitely a treat! So that was that, I thought, and carried on. However, Lewis Road Creamery saw my nails and liked them, so they sent me a free bottle - I was stoked! It was delivered to my door with a little ice packet inside to keep it cold. It was the first thing I had to drink that morning, and I drunk it properly this time. It. Was. Amazing. I kept it in the fridge and every hour/half hour I'd come back and take a mouthful of and swirl it around my mouth, making sure to taste the full flavour. I've now decided this is the proper way this milk should be consumed; not all at once with a meal (such a waste! ), but as a delicious treat that you keep coming back to. It was SO satisfying and delicious the second time around. My mum and sister even snuck by after school to have a mouthful, and agreed with me. 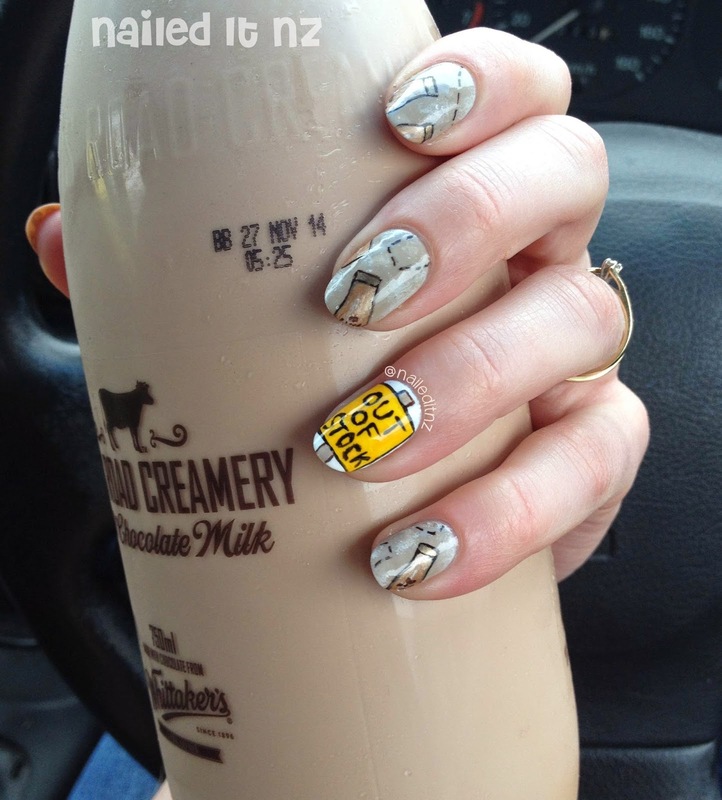 So that's my adventure in Chocolate Milk land, and the story behind these nails. I felt that I had to explain it fully, otherwise all my overseas followers wouldn't know what I was talking about! Basically, New Zealand is an adorable place, and the mainstream media have the space to devote what by now must be hundreds of stories to Chocolate Milk. I love my little country. Of course, bad things happen all the time here too, but I do think this little piece is quite representative of our culture. I'm brainstorming other New Zealand themes to paint on my nails. Weetbix is high on the list as I go through that by the truckload! I've done Marmite, the flag, a kiwi, Little Shop, Auckland, Kiwi Christmas and probably more... let me know if you're from NZ and have any ideas! On a side note, I am completely exhausted, and can't believe I finally got this post up. If you follow me regularly, you'll know that my husband and I are moving to Auckland in the New Year. This requires a lot of planning! We've just moved out of our flat (waaaah bye bye nail room), and I had forgotten how much I hate moving. It's never-ending! We're now house-sitting for six weeks, then a little after than we'll be moving up to the big city. Even once we're up there there's a lot to do. We're staying with family for the first little bit, then will move semi-permanently to another place, which we'll be doing up, to some degree. We'll also have to buy furniture again, as we sold ours recently, so that'll be... fun! Lots of exciting changes coming up, and I'll keep you posted. Hope you found this post interesting! If you've tried this chocolate milk, let me know what you think of it in the comments.